* Originally posted on May 29, 2015. 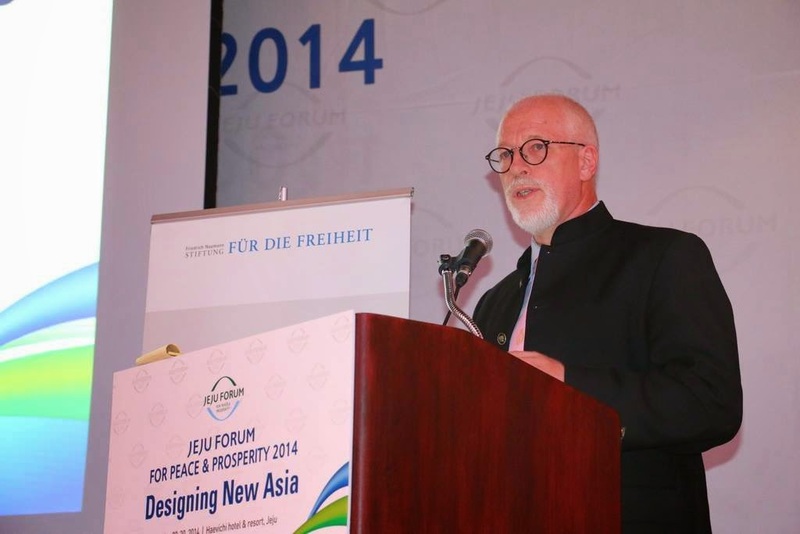 Last week, Economic Freedom Network (EFN) Asia and Friedrich Naumann Foundation for Freedom (FNF) participated at the Jeju Forum for Peace and Prosperity 2015, with its own session about free market environmentalism, held last May 21 afternoon. Welcoming Remarks were given by Rolf Mafael, German Ambassdor to S. Korea, and Siegfried Herzog(speaking in this photo), FNF Regional Director for Southeast and East Asia, based in Bangkok, Thailand. Session speaker was Dr. Oyun Sanjaasuren, President of the UN Environmental Assembly; Former Minister, Mongolia’s Ministry of Environment and Green Development. (c) Dr Yun Sangho, Research Fellow, Division of Public Policy Research, Korea Economic Research Institute (KERI). 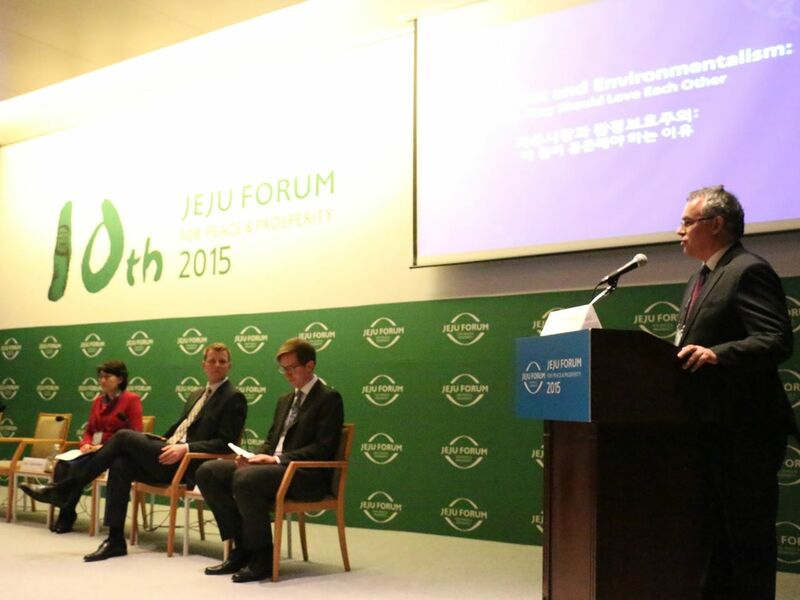 Moderator was Matthias Grabner of the Austrian Chamber of Commerce in S. Korea. Photo below, from left: Sungho (hidden), Rasaily, Hoene, Sanjaasuren, and Grabner. – The world population stands at about 7 billion today. The UN predicts that by mid-century it will have grown to more than 9 billion. This will lead to an immeasurable growth in resource consumption and put significant pressure on the planet. If this trend continues then “business as usual” has to be changed in order to sustain further growth. – The Asia-Pacific region consumes more than 50% of the world’s resources and is responsible for more than 50% of world-wide emissions. – It is important to keep in mind that pollution “knows no boundaries”. Therefore, environmental protection has to be viewed as a global concern that can only be achieved through international cooperation, using the most efficient means. – The role of governance (e.g. through regulations or incentives) is very important in succeeding to protect the environment and bring about sustainable development. But lasting success can only be achieved if businesses embrace sustainable practices. This is where free market practices come in. A good example is the European Union Emission Trading Scheme because it is an incentive for businesses to be more efficient and clean. – To achieve environmental protection solely through regulatory means can be problematic, for example in developing countries where extractive businesses (e.g. mining) are often state-owned. This leads to the government’s being both a regulator and an operator (through ownership) and therefore to a conflict of interest. – Environmental protection can therefore be better achieved by a market-based approach, meaning that businesses should be given the incentive to regulate themselves. Market forces compel businesses to become more efficient and less wasteful. This argument is supported by a recent study by the Heritage Foundation which shows the clear correlation between economic freedom and environmental protection. Economically free countries perform better when it comes to environmental protection. – Market-based approaches to environmental protection should be supplemented by regulatory measures only where it is necessary for governments to step in. Below, from left: ?? 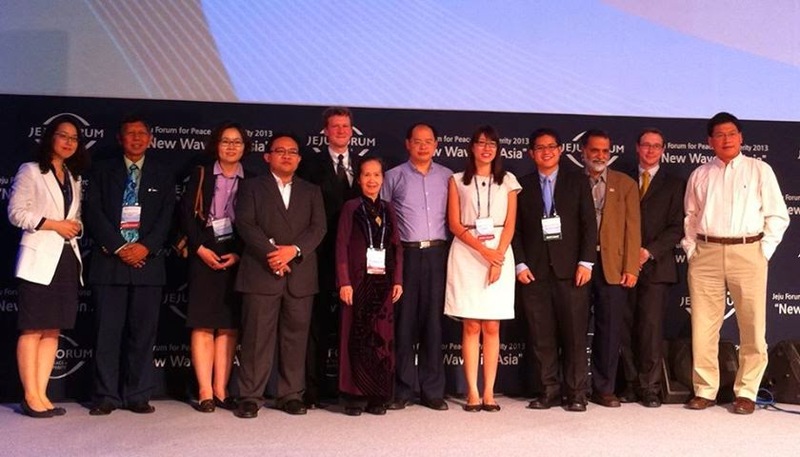 ?, Lars-Andre Richter, FNF Country Director for S. Korea, Sungho, Pett Jarupaiboon, EFN Asia Program Manager in Bangkok, Sanjaasuren, Ms. Kim of FNF-Korea, Hoene, Rasaily, Herzog, Grabner, and Miklos Romandy. Thanks to Pett for sending me the report. All photos here from the FNF regional office’s facebook page. * Originally posted on May 08, 2015. 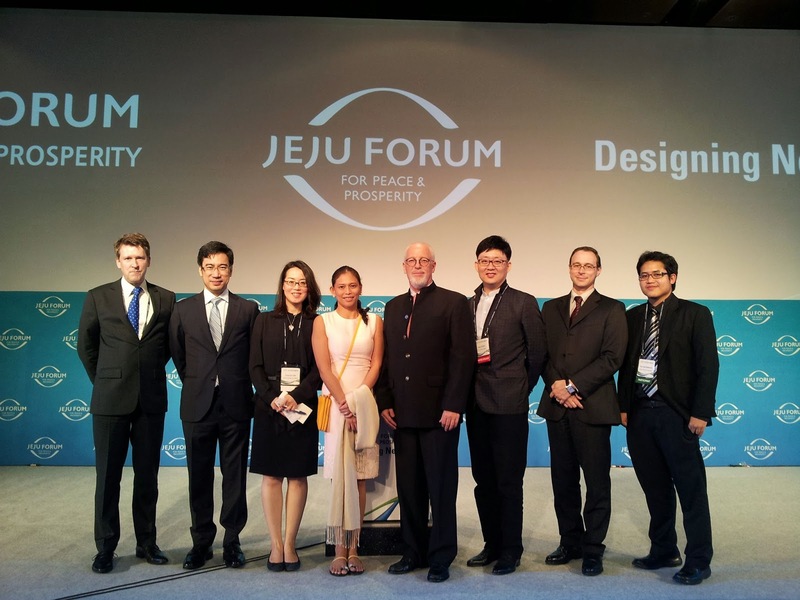 EFN Asia and the Friedrich Naumann Foundation for Freedom (FNF) will participate once again in the big annual international conference in Korea, the (10th) Jeju Forum for Peace and Prosperity, May 20-22, 2015. 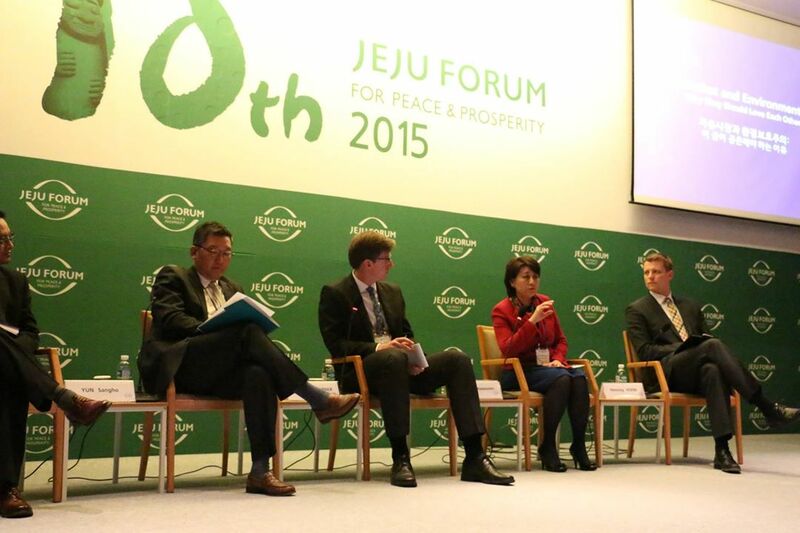 Although Jeju Forum was first organized in 2001, EFN Asia participated for the first time only in 2013 by having its own panel discussion, “Dealing with Economic Nationalism“. I was part of the contingent, as Panel Rapporteur. 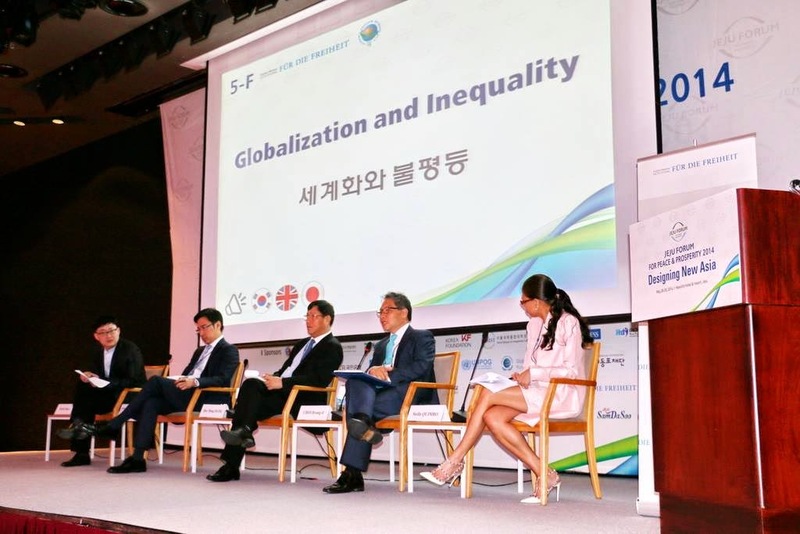 Then EFN participated again last year, its panel discussion was about “Globalization and Inequality“. This year, the overall conference theme will be “Towards a New Asia of Trust and Harmony” and EFN’s panel discussion will be on “Free Market and Environmentalism: Why They Should Love Each Other”. As the title suggests, the EFN session will look into ideas and movements that have promoted free market principles and schemes as the best way to conserve the environment. Free market environmentalism can be a good way to address environmental degradation rather than direct government involvement. How? Via clear property rights delineation and protection, which mitigates the ‘tragedy of the commons’ problem. A poor villager enters a non-guarded public forest land and cuts trees, big and small, that he can haul and transport. The land and the trees in it belong to everyone and no one in particular, so if he does not cut and get those trees today, someone else will cut them tomorrow or next week. And that is how many public forest lands in developing countries with weak rule of law and property rights protection, become bald and degraded. 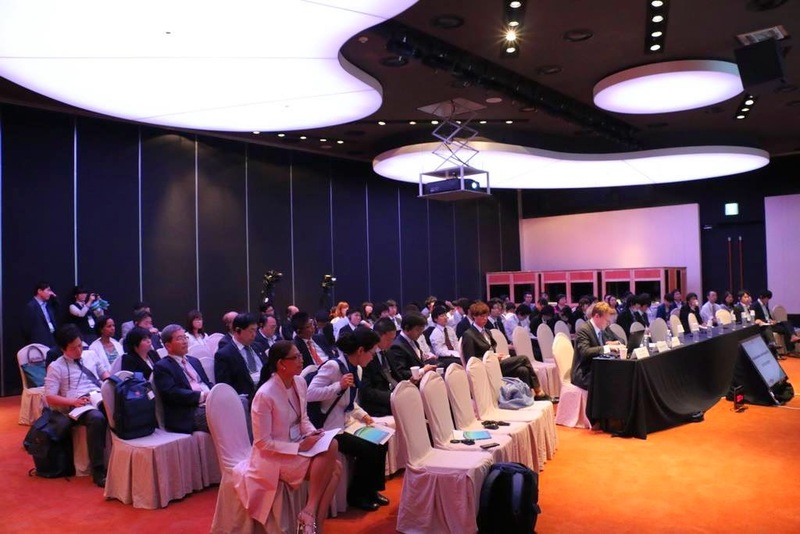 The “meat” of Jeju Forum is the many simultaneous panel discussions that participants can choose to attend. Normally about six different topics are discussed, same time at six different discussion or meeting rooms. The EFN panel will be on May 21, 3:40-5 pm. The Panel Moderator will be Matthias Grabner of the Austrian Chamber of Commerce in S. Korea. Welcoming Remarks will be given by Rolf Mafael, German Ambassdor to S. Korea, and Siegfried Herzog, FNF Regional Director for Southeast and East Asia. Keynote speech will be given by Dr. Oyun Sanjaasuren, President of the UN Environmental Assembly; Former Minister, Mongolia’s Ministry of Environment and Green Development; and currently the Chairperson of the Council of Asian Liberals and Democrats (CALD). The panel Rapporteur will be Miklos Romandy, Regional Programme Coordinator for FNF Southeast and East Asia. There are plenary sessions with some big name speakers, usually former heads of states. 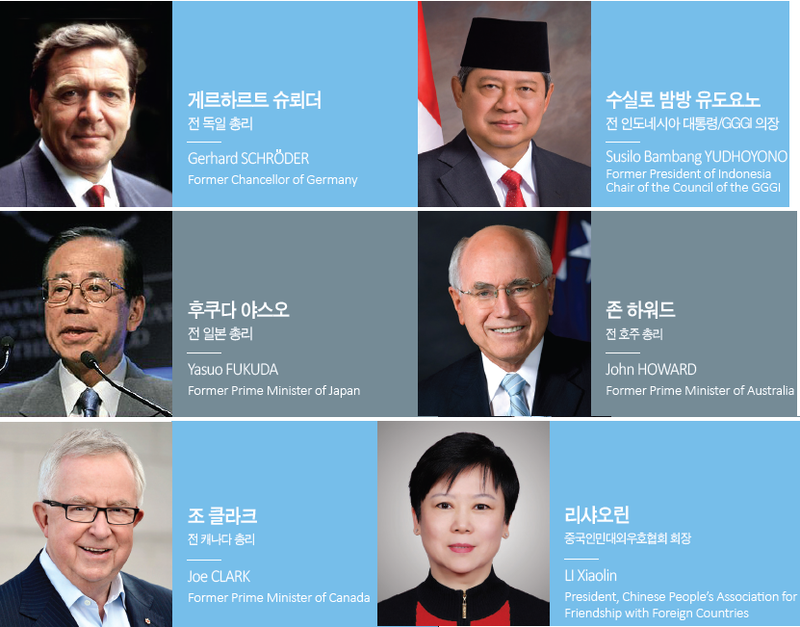 The following are among the plenary speakers, including luncheon or dinner speakers. This year is the 70th anniversary of the end of World War 2. People now are busy talking about trade and investments, jobs and entrepreneurship, tourism and cultural exchanges, mobile phones and other gadgets, and so on. Wars and invasion of other countries or territories are far out from their minds. Only current dictators, would-be-dictators, and lovers of more government coercion are talking about wars and invasions. Peace and Prosperity. Around the world. They are noble goals that responsible governments, industrious people and useful civil society organizations like EFN Asia and FNF should continue to assert. 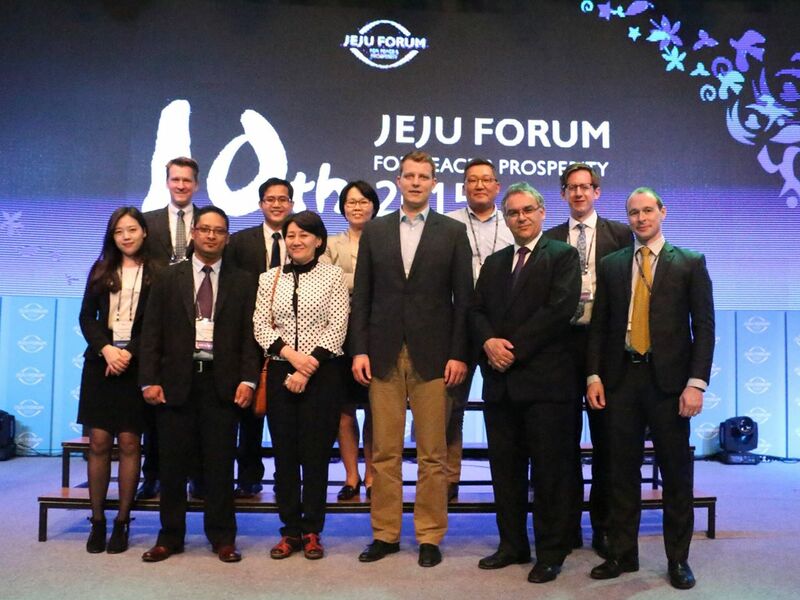 The Jeju Forum is a good platform for such useful and productive discussions. I am happy that EFN continues its participation in this important annual international conference. * Originally posted on . 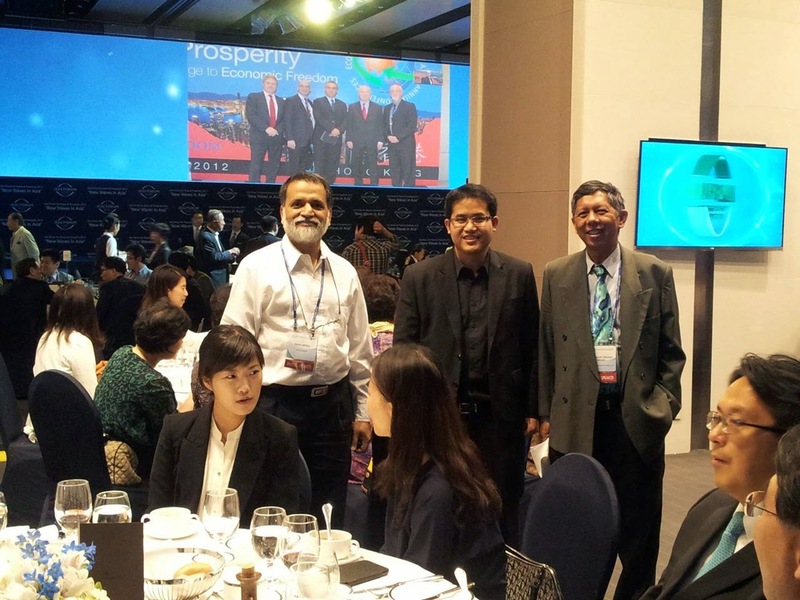 This is the Rapporteur’s Report for the panel discussion sponsored by Economic Freedom Network (EFN) Asia last May 29, 2014, at the Jeju Forum for Peace and Prosperity, Haevichi Hotel & Resort, Jeju island, S. Korea. Thanks to Pett Jurapaiboon, EFN Asia Regional Program Officer, for sharing this with me. I am adding photos from the FNF East and Southeast Asia fb page. In this photo, from left: Peter, Sethaput, Dep. Minister Dang, Choi. According to RA the fundamental value of liberalism is freedom. He criticizes Thomas Piketty whose suggestion of a global tax on wealth to solve the problems of inequality (i.) he calls a “Robin Hood tax”. Amb. RM points out that the session’s topic has two dimensions: a domestic one and an international one. He refers to a recently published study of the German Bertelsmann Foundation on i.. His suggestion to reduce it: to promote the integration of more countries in the global economy by completing the Doha Round. – Synopsis: Globalization (g.) is the process of international integration arising from the interchange of world views, products, ideas, and other aspects of culture. There are many reasons for economic inequality within societies: of bad schools, single motherhood, “de-industrialisation”, bad behavior by poor young men etc. G. however can decrease inequality. Having joined the global labor force, hundreds of millions of people in developing countries have won the chance to escape squalor and poverty. Regarding this, Southeast and East-Asia as a region which has benefited tremendously from g., should play a much stronger advocacy role for freer market and more g.
– Synopsis: The absolute number of the world’s poor has stopped rising since 1950s and has fallen in recent decades, thanks to the rapid growth in emerging economies, most notably China and India. People climbed their social ladders from the poor to the middle class, and to the rich. This process continued to work its way, and helped to diminish inequality in a national economy. CBI reminds not to mistake inequality for poverty. Moreover he emphasizes that the aim of a society can’t be equality. Politics should now design a financial system to ensure that an economy does not become hostage to the big financial institution. As witnessed in the 2008 crisis, ‘privatization of success, and socialization of failure’ is against market principle. – Synopsis: There is no better argument that g. is beneficial than to compare South- with North-Korea. I. has often little or nothing to do with g.. Differences in income stem largely from things like access to quality education. An even bigger problem than the i. of income is the one of justice. In Southeast Asia for example, wealth has tended to be concentrated in non-tradable or highly regulated sectors. By opening up these sectors to greater competition, g. could help create a more level playing field. The best instruments to reduce i.: the fight against corruption, the liberalization of the market and the strengthening of the rule of law. – Synopsis: There have often been attempts to eliminate inequality, for example the extreme form of egalitarianism in Mao’s China. All failed while the world over the past 60 years has seen inequality declining. A hot topic of the discussion on g. are the low skilled workers. How to protect them -who already have enjoyed basics like uninterrupted electricity supply, clean water, shelters, more than adequate protein intake- in the developed world? Is it justifiable and moral to reverse globalization such that the end result is sending back little girls in Indian, for instance, from factories back to brothels? In general: The Scandinavian system of social welfare often serves as a role model. But according to PW Asian countries can’t adapt than. According to CBI the ROK has a very restricted labor market. Conflicts between management and trade unions are the normal case. Moreover the outgoing investment is bigger than the incoming. G. has been accepted as the engine of the economic success for a long time. That feeling is coming to an end. DHD stresses that the government must ensure that people have access to opportunities. The keyword is inclusivity which for him is a precondition to avoid inequality. Other keywords are Good governance and transparency. For SSN the crucial point is the access to education. Moreover he deplores that the financial situation of Thailand’s MPs is much better than the one of the people they represent. PW claims to reduce the number of market regulations effected by the state. * Originally posted on May 29, 2014. Below is the group photo of EFN delegates to the 2014 Forum. From left: Lars Andre Richter, Country Director of the Friedrich Naumann Foundation for Freedom (FNF) for South Korea, Dr Sethaput from Thailand, Sungeun Lim of FNF Korea, Dr Stella Quimbo of the Foundation for Economic Freedom (FEF) in the Philippines, Rainer Adam, the outgoing FNF Regional Director for East and Southeast Asia (he’s moving to head the FNF Regional office for East and Central Europe next month), Peter Wong of Lion Rock Institute (LRI) in Hong Kong, Miklos Romandy of FNF Regional Office in Bangkok, and Pett Jurapaiboon, the Regional Program Office of EFN Asia. Not in the picture but part of the EFN delegation are Dr Choi Byung-il from Korea, and Vietnamese Deputy Minister, Dang Huy Dong. Dr. Rainer Adam gave the opening message for the EFN session today on “Globalization and Inequality”. The EFN panel of speakers and discussants. Peter Wong leftmost; Deputy Minister Dong, middle, was the main speaker. Good audience in the EFN panel discussion today. All photos today from Miklos and Pett. * Inequality is inevitable. And a good thing too, it penalizes laziness and irresponsibility with poverty, while it rewards hard work and efficiency with prosperity. Nature-made catastrophe like volcanic eruption, strong earthquake, heavy flash flood, which damage or wipe out important investments like a farm, house, factory, etc., there are various layers of safety nets and solidarity coming, like donations (public and private), reconstruction of public facilities like roads, bridges, drainage. So that nature-created poverty can be quickly addressed. * The degree of inequality around the world has increased but the material condition of the poor has also increased or improved. One proof: Before, the Filipino poor were riding bicycles or carabaos or horses. Now the poor ride motorcycles. Before, the Filipino poor or even middle class could not afford to have cell phones. Now the poor have smart phones, some even own tablets. Another proof is rising life expectancy. Before, Filipinos on average die at age 50, 60 years old. As of 2009 or 2010, the average life expectancy of Filipinos was 69 years old (67 for males, 72 for females). By now I think average life expectancy is already 70. * If there is no inequality, people in many countries will be equal… equally poor and destitute. ala N. Korea. * One chart from John Stossel here. Global poverty in absolute number is high because global population is rising. But global poverty (then defined as earning $1 a day/person) as percent of global population is declining. But the UN and the multilaterals keep saying “poverty remains high and alarming”, they changed the definition of poverty to earning $2 a day/person. * Governments and the multilaterals are dishonest in discussing poverty. If they want more money from taxpayers, they say “poverty remains high, very alarming”, things they were saying 6 decades ago or more. When they want to brag about their “accomplishments”, they say that “poverty has declined but there are challenges”. * Originally posted on April 24, 2014. The head of the Secretariat is the Regional Program Officer for EFN, Pett Jarupaiboon. 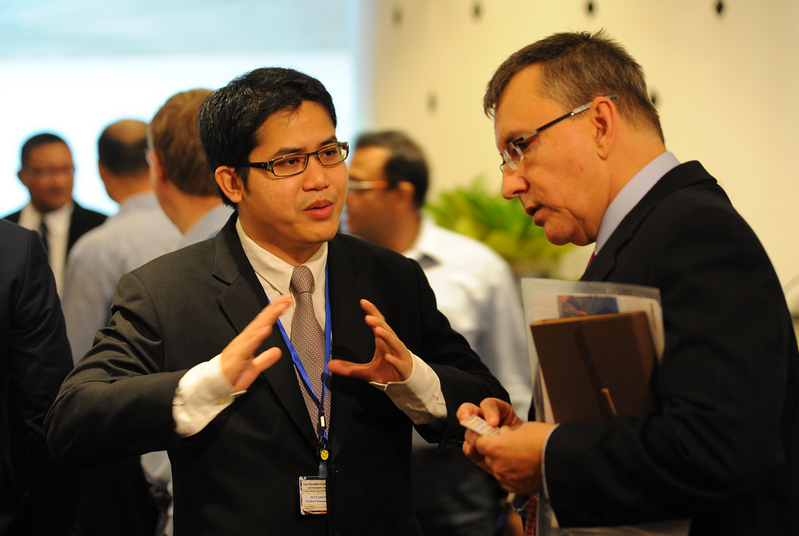 Here, Pett is talking to Fred McMahon of Fraser Institute (Canada) during the EFN 2013 Conference in Bangkok last year. Pett joined the FNF in 2009 I think, taking the place of Gorawut Numnak. I met Pett first time in 2010 during the EFN Confernce in Jakarta. The guy is your typical silent, always smiling but very hard working person. Aside from being the regional officer for EFN, he is also the regional officer for Human Rights campaign of the FNF. At Jeju conference, below. 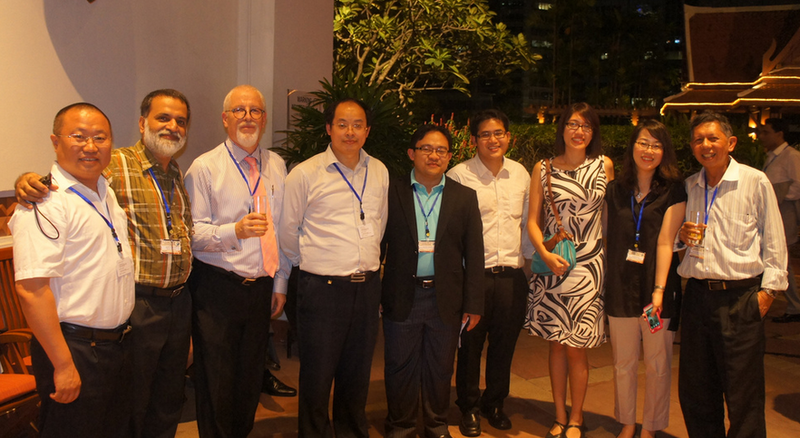 From left: Sung-eun Lim, me, Ms. Kim, Wan Saiful Wan Jan (Malaysia), Lars Richter (Country Director for S. Korea), Pham Chi Lan (Vietnam), Feng Xingyuan (China), Tricia Yeoh (Malaysia), Pett, Barun Mitra (India), Miklos Romandy (Austria), Liu Junning (China). Not in the photo with our group was Sam Raimsey (Cambodia). Thanks for all the hard work Pett. Happy birthday. * Originally posted on June 10, 2013. 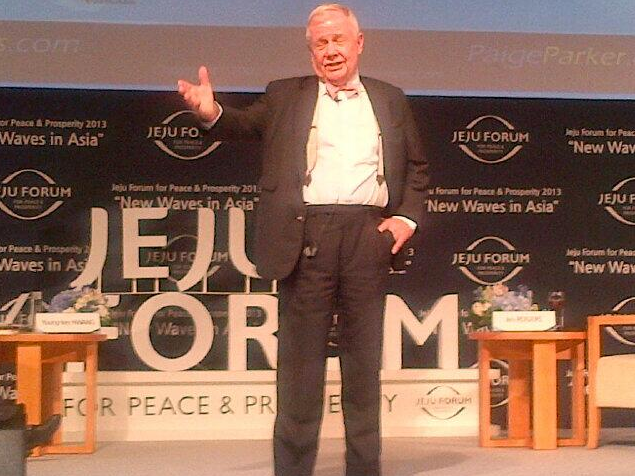 Among my favorite talks at the recently concluded Jeju Forum for Peace and Prosperity where the Economic Freedom Network (EFN) Asia participated, was the talk by a world reknown investor, Jim Rogers. This guy is a co-founder of Quantum Fund with George Soros. Although he became rich in the US, he moved to Singapore in 2007 as he solidified his belief that this is the Asian century. He has been an investor and businessman, a bike adventurer (he toured the world on motorbike in the 80s, then in early 90s) and never joined politics and government. 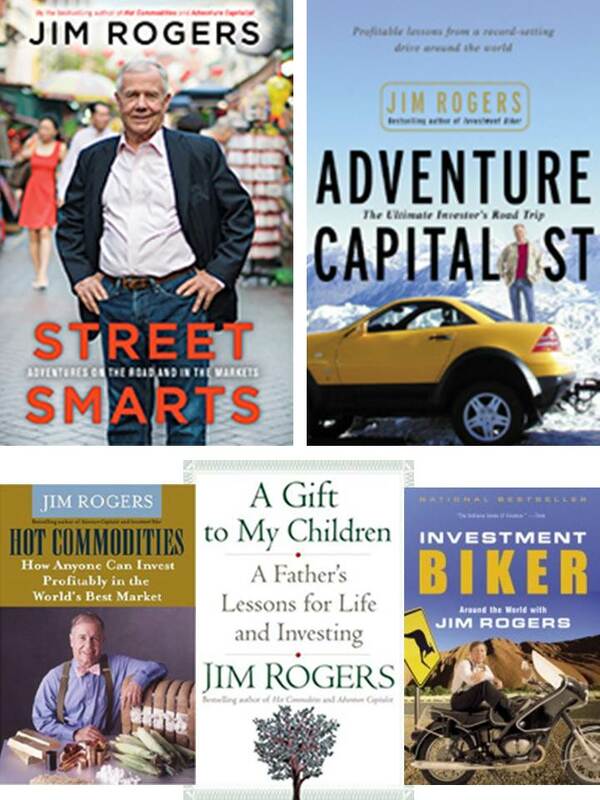 Photos below are some of his books from his website, http://www.jimrogers.com/. China remains the most dynamic country in the world. If i were you, I’d teach my children Chinese, not Japanese. North and South Korea will merge in the next 4, 5 or 6 years. A united Korea will be the most exciting economy in the world. Just neighbor to China and Japan. With 60 million people, lots of natural resources, next to China, Myanmar is one of the most attractive places to invest right now. The Japanese are destroying their currency, courting the collapse of the yen. Abenomics will be a disaster, no economy has been helped in the long run by over-printing money. This is the Asian century, the most dynamic continent in the world. Those earning MBA’s, “Learn to drive a tractor” and “be a farmer” because agriculture to boom. Stay away from banking and finance. I like his recommendation that people should invest in agriculture and food production. And rightly so because not only that global population is rising especially in Asia, but demand for high value crops, diversity of food demand is rising fast. And even in countries with greying population, the population of pets is also rising and these animals also need more agricultural products. 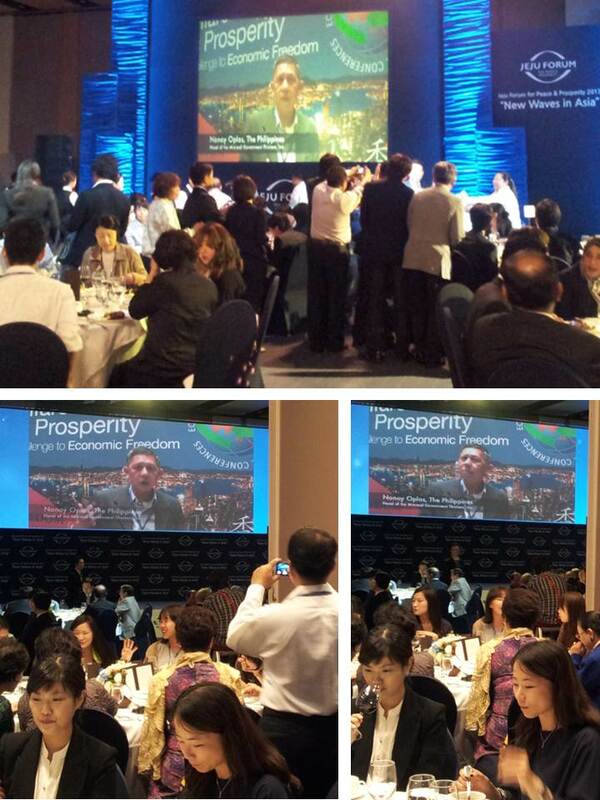 Meanwhile, some photos sent to my by Pett Jarupaiboon, the Regional Program Officer of EFN Asia in Bangkok. This was on the 2nd night (May 30) of the Forum, at the grand ballroom where the EFN Asia video was repeatedly shown, and in one part of the video, I was one of those interviewed. Pett took photos of the video as shown in the ballroom. Thanks Pett.